I’m not sure exactly why it is, but human beings have a remarkable sixth sense for determining how malicious and evil a company might be based on its name. It’s one of those mysterious of nature, like twins who can sense when the other is too close to a shark or alligator. We hear these company names and we just know they are evil. Just look at some of the most dangerous companies ever conceived of; Cyberdyne Systems, Weyland Yutani, Wolfram and Hart – their names just ooze malevolence. Now, we can add a new name to that list too; Futuretech. To recap, in Red Alert 3 the Tim Curry-led Soviet forces used a time machine to travel back in time and kill Einstein. In the super-camp Red Alert 3 world the Soviets hoped that killing Einstein would disrupt the technological advances of their enemies enough for Russia to gain the upper hand. Returning to the present, Tim Curry and Co. were delighted to find that their plan had worked to a degree; nuclear power is still in infacy and the Allied forces are near defeat. The excitement was scuppered somewhat though by the arrival of the Imperial Army of the Rising Sun – an Eastern coalition fronted by an army of transformers and mecha. Then, as time goes on, the Allies are revealed to have advanced weapons of their own still, many of which focus on time travel. This begged the question then; in a world without nuclear power, how come all three armies have such advanced weapons? An Einstein-less world still has Chronospheres, lightning tanks and giant robots? It makes little sense. 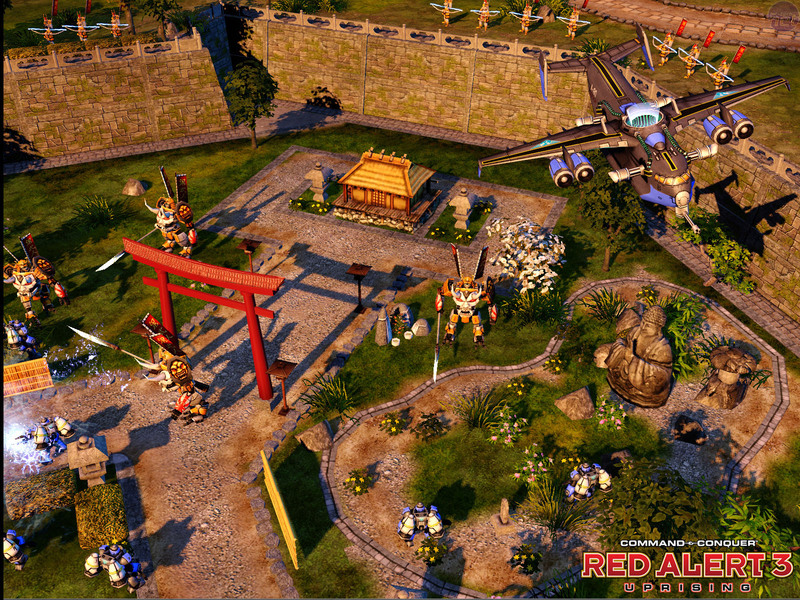 It’s this issue that Electronic Arts is focusing on resolving in the new Command and Conquer: Red Alert 3 expansion, Uprising. Put simply, one company has been supplying all these technologies to the various armies. That company is the mysterious Futuretech, which was shadily alluded to in the prior game. Futuretech has been getting this dangerous new weaponry from sources unknown, doling it out and profiting from the sales to all three sides in the war. It’s despicable and irredeemable – and we knew it all just from the sound of the name. 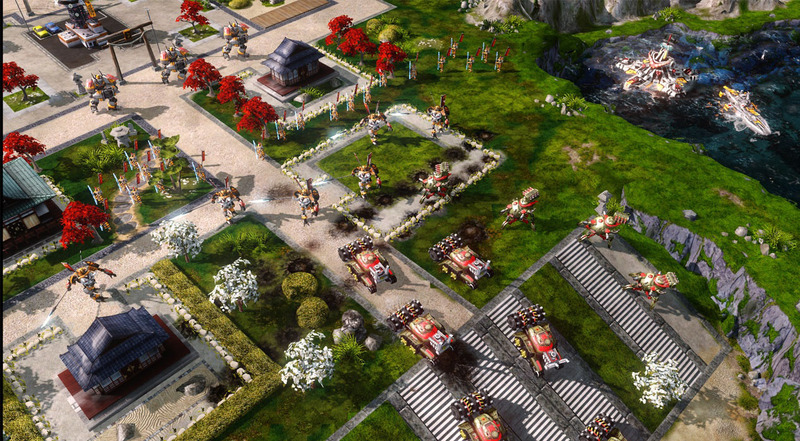 Uprising then does the standard for the Command and Conquer series and follows on from the Allied campaign of the main game, electing that storyline as the canonical one. The Allies have vanquished their enemies and conquered the world in the name of freedom, liberty and lots of pictures of Gemma Atkinson in a low-cut top. Lovely stuff. Unfortunately, Gemma’s wardrobe might be a bit too distracting for the Allies, as the Soviets and Imperials start to revolt against their new leadership...with the aid of Futuretech, of course. Slowly but surely the two Eastern powers bring their armies back and unveil some powerful (and slightly demented) new units which they hope to crush the Allies with. Civil uprising is a nice enough excuse for war of course, but the real driving point behind the new campaigns in Uprising is Futuretech and what it is hoping to gain from the impending conflict.